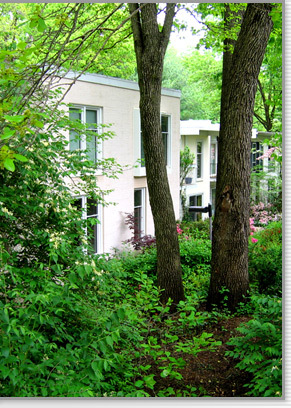 Coleson Cluster in the historic Lake Anne area is one of the original Reston neighborhoods. One of the joys of walking the paths of Reston is discovering the charming neighborhoods tucked away off the main streets. Coleson Cluster is one such gem. Coleson Cluster was the third neighborhood built back in the mid-1960s, designed jointly by Reston founder Bob Simon and nationally recognized modernist architect Chloethiel Woodard Smith (who also designed Waterview Cluster, as well as many notable commercial and residential buildings in the DC area). Set off from main streets and nestled amid towering oaks, the cluster embodies the small-town, European vision Simon had in mind when envisioned Reston. With 45 units, the cluster is designed with large front patios that extend to the public walkways. And each grouping of townhouses shares a carport. Both promote neighborly interaction, something that the residents love about their cluster. The townhouses are easily identified as a Woodard Smith design with her signature floor-to-ceiling windows on each level of every house, at least one set of sliding glass doors, brick exteriors, and flat roofs. Walking through this cluster feels like walking down a street in Italy. For those who love to walk, Coleson Cluster is a quick walk to both Lake Anne Village Center and the Reston Town Center. And with easy access to the Toll Road and Fairfax County Parkway, and just a few miles from the new Metro, getting where you need to go is convenient. Click here to learn more about living in the historic Lake Anne area of Reston.